To check PF balance, EPF has provided different methods to make it easy for employees. EPFO has won “Gold Award” for innovative use of technology in e-governance (2015-16). This shows how epf is making every effort to move everything online. I am mentioning this because the number of facilities available to employees to manage pf account. Lets get into the main topic of this post. You can check epf balance in 4 different ways. I will provide detailed procedure to know pf balance. 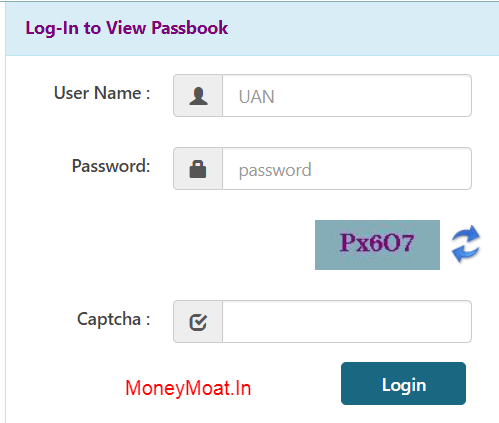 You can check pf balance by using member passbook portal. For this purpose you need to activate UAN Number. UAN number is useful for all employees working in organized sector. It is allotted to each and every subscriber of EPF. If you don’t know your epf number, you should read this post on How to Know UAN Number from PF & PAN Number. Once you obtain UAN number, you need to activate UAN number. Once you did all these things, head over to UAN Passbook Portal. Enter UAN Number and password that you set while registering on the UAN Member Portal. Enter captcha code and login. After logging in, click on button on the left side. Now you can see complete details of monthly transactions. 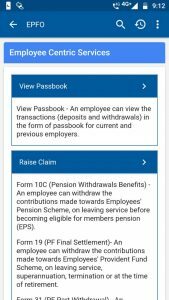 It is EPF Passbook. You can see contributions made by employee and employer in pf account since you subscribed to epfo. You can also see interest credited annually. 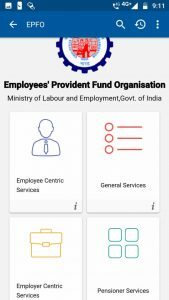 Employees contribution total and employer contribution to provident fund account can be found on top of page. If you don’t know how Pf contribution is made by employee and employer, read that post. This is the first method for epf balance enquiry. 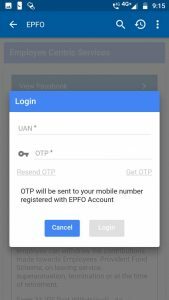 Umang app can be used for EPF balance enquiry. Just download Umang app from google play store. Click here to Download Umang App by MeitY, Govt of India. Umang app is very useful for many other services. We will talk about them in my next post. Step 1: Download and install Umang app from the link provided above. 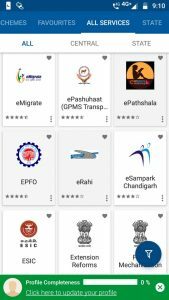 When you first open umang app, you will a lot of options. Scroll down till you find EPFO option under all services tab. select EPFO option. You can check below screenshot for reference. It will list all epf facilities. It allows employees to access their account details and allow us to make withdrawals, transfers etc. on app. You need to link Aadhaar number and UAN number to make withdrawal requests. However to view your passbook, Aadhaar is not necessary. Step 2: On the next page, tap on ‘Employee Centric Services’ option. Step 3: On this page, tap on ‘View Passbook’ option. Step 4: Then you will encounter login page. You have to enter UAN number and tap on Get OTP link. Then you will receive OTP to mobile number registered with EPFO. Enter OTP. Then it will display epf passbook showing Pf balance and monthly transactions. This is how you can perform epf balance check on mobile. You can check Pf balance by sending SMS from your epf registered mobile number. This facility is available in 10 languages. You can get epf balance particulars in English, Hindi, Telugu, Punjabi, Gujarati, Malayalam, Marathi, Tamil, Kannada, and Bengali. You must change LAN with your preferred language. See below for codes. For this to work, you should have activated UAN number & KYC details are updated. To update kyc you need to enter PAN, aadhar number on epf member portal (if not updated). If you cannot update your kyc details online, you must contact your employer and give him Epf Joint Declaration Form. I have explained about this form in that post. If you wish to get UAN balance details in your preferred language, you must replace ‘LAN’ with your preferred language. 1st 3 letters of the language you prefer is the code word to receive updates in the language that you wanted. Language Codes: English – ENG, Hindi – HIN, Telugu – TEL, Punjabi – PUN, Gujarati – GUJ, Malayalam – MAL, Marathi – MAR, Tamil – TAM, Kannada – KAN and Bengali – BEN. I entered my 12 digit UAN number and the preferred language i choose Telugu. Once you send this sms, you will receive Epf balance within minutes. This is how to check pf balance by sms from your registered mobile number. You can also check Pf balance by giving missed call from your registered mobile number with epf. This is simplest process of all methods mentioned here. You can give a missed call on 011 22 901 406 to know your current EPF balance. This service available at free of cost (Toll Free Number). For any of the methods mentioned here, you must activate UAN Number. The same applies to this method also. So first activate UAN number before proceeding further. Once you call upon this number, it will ring for 2 times and then call will be dropped. Within few minutes, you will receive SMS containing current pf balance. This method works even if you don’t know your UAN Number but it was activated by your employer without your knowledge from their end. This is a way to check pf balance without UAN number. In this method, you don’t have to do anything but activation of UAN Number. Once you activate UAN, you will receive monthly updates whenever there is a transaction. You will receive contributions into your pf account as well as current pf balance details. If you don’t have UAN Number, You must know UAN number and then activate UAN number. Once you activate, you will start receiving monthly updates. You must wait for 45 days to start receiving monthly updates. If you wish to get provident fund balance information any time you want, you must follow other methods mentioned above. This is all about pf balance check with UAN Number to get monthly automatic epf balance updates. This is the end of main topic about ‘How to Check PF Balance – EPF Balance Enquiry’. If you have any problem in getting pf balance details, kindly comment below. I will try to help you out. Here below, i will talk about few topics people ask usually about EPFO. If you are interested, you can further read. People search on google about topics related to this post. I have included these queries below and answered them. How to check pf balance for exempted establishment: For this topic i have created a new post. Kindly visit that post. How to check epf balance without uan number: You can do so by following ‘Pf balance check by missed call’ method mentioned above. This method works when your UAN number was activated by your employer without your knowledge from their end. This is a way to check pf balance without UAN number. How to withdraw pf balance: This is very big topic. So, i wrote a new post on how to withdraw epf balance online and offline methods. Please visit those posts. Whenever you change job. It is necessary because you have to ensure that new employer is crediting the contributions to old UAN number. So that your old balance will be carry forwarded from old employer. Otherwise it will create problems when you try to withdraw this balance. Whenever there is increase in basic salary and DA. Epf Contribution will increase when basic pay and DA increases. Usually organizations with good practices will not commit this mistake. It is very case. But i have to mention it. Sometimes, employer does not deposit their contribution. It may be very difficult to get back this amount if a company shuts down. Thus, it is necessary to know the status of your PF balance frequently. Is it possible to avail loan on epf balance: Yes, it is possible. Please check my post on epf balance withdrawal. It is always wise to keep a tab on our investments. Otherwise, if something goes wrong, you have to do even more work and sometimes the damage cannot be reversed. When it comes to Employee provident fund, it is your retirement savings fund. Retirement fund should grow in slow and steady manner without any hiccups. So, EPF is best fit for this kind of fund. Also, EPF balance can be useful at times when you require money for emergency needs. Even though it is not recommended to use retirement funds as emergency fund, when you have no other option, Provident Fund balance will help you a lot. I have already written a post on importance of the Emergency Fund and how to save for it. This saving can be useful at testing times. This is all about ‘How to Check PF Balance – EPF Balance Enquiry’ Post. Thanks for visiting MoneyMoat.In. Keep Reading!